There's certainly nothing like a good dumpling restaurant and it's hard to find a higher concentration of these little gems than in Chatswood. The region's large Chinese population means that these delicious parcels of dough, meat and vegetables are omnipresent, albeit sometimes tucked away just out of sight. New Shanghai is one such dumpling mecca with two restaurants in the area – one at the Chatswood Chase shopping centre and the other hidden away in the Lemon Grove centre on the concourse. Both are wonderfully authentic in taste and variety, however the Chatswood Chase version of the store wins me over every time because of the gorgeous décor. Lemon grove is clean, white and tiled, whereas Chatswood Chase is decked out with red lanterns, wooden furniture and immediately transports visitors from the sterility of the food court into a traditional Shanghai dumpling house, complete with a viewing window where patrons can watch their famous dumplings being made. Menu-wise, it's all good but look out for the red marked restaurant specials on the menu as these are extra good. You'd be crazy not to try the Xiao Long Bao (Soupy pork dumplings) as these are the best going around in my opinion. 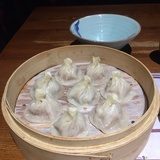 My only criticism is that these little parcels of soupy pork meat are meant to be served with grated ginger, but the restaurant makes you order ginger separately for fifty cents – I always forget and then am faced with having to chase down a staff member for the ginger once my dumplings arrive. With a BYO and buy in-store liquor selection, New Shanghai is a great and very reasonably priced night out. Be prepared to get there, sign up for a table and wait a while in peak times, but the lines usually move pretty quickly. You can learn where to find a New Shanghai near you here. Nice article and welcome to Weekend Notes.